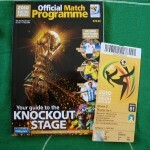 There were no official individual match programmes for the 2010 tournament, but three were published covering the Group Phase, Knockout Stage and the Final. 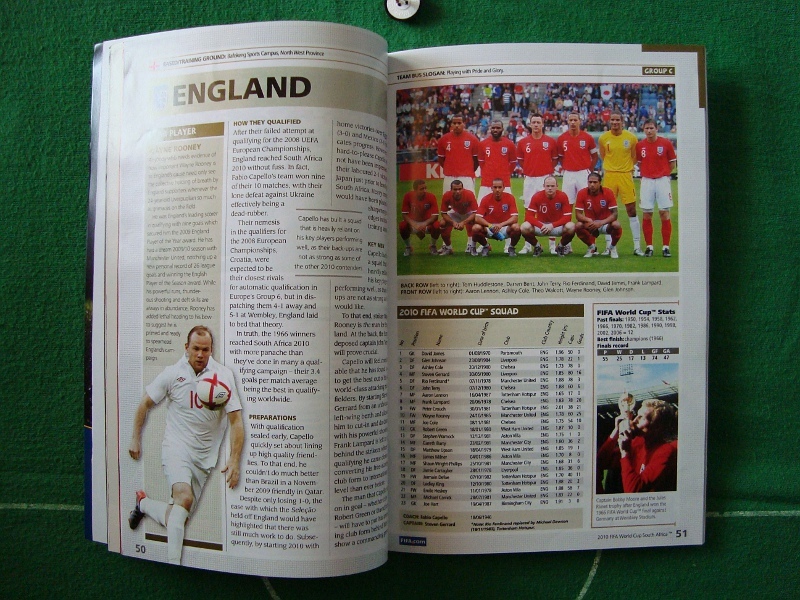 The second of the three publications covers the Second Phase match between Germany and England in Bloemfontein/Manguang; costing seventy South African Rand (approximately £6/EUR7), this hefty yet compact guide contains 164 pages and includes an overview of the thirty-two competing teams, a review of all forty-eight group stage matches as well as a foldout section at the back containing the complete tournament match guide. In England, when you mention the German team to anyone under forty, the first match that will come to mind will be the 5-1 victory in Munich in 2001. 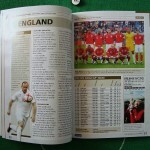 The recording of the match became a best-seller, and every time England supporters needed a pick-me-up highlights of the “Massacre in München” would be rolled out. Indeed, probably the most iconic image in English football – bar the famous shots of Bobby Moore with the Jules Rimet trophy in 1966 – was of the Olympiastadion scoreboard: “Deutschland 1:5 England”. Of course, the game was in the end meaningless as both sides qualified for the World Cup in Japan and South Korea; more significantly, Germany went on to reach the final with England being eliminated in the last eight. Still, nothing could stop people in England crowing about their biggest competitive victory against Germany – until a sunny afternoon in Bloemfontein nine years later. Under the Southern African sun, an England team brimming with overpaid and in many minds overhyped talent that had promised so much were simply blown away by a young, unpretentious and dynamic German side that could have easily scored six or seven. There was even a disallowed Wembley-Tor thrown into the dramatic mix to make the game even more memorable – providing ample payback for both 1966 and 2001 in one sweet ninety-minute package. Both sides had come into the tournament with differing expectations: while not much had been expected of a young German side missing a number of first-choice players including their talismanic skipper Michael Ballack, England’s so-called “golden generation” had been tipped by many to progress to the latter stages of the tournament. By the time the first phase had come to an end however perceptions were more closely matched: apart from an unfortunate blip against Serbia Joachim Löw’s side had impressed many neutral observers, while England seemed to have sunk into a malaise that had seen them draw against both the United States and Algeria before booking their place in the second phase with an arguably fortunate 1-0 win over Slovenia. While the German camp was full of happy young faces, there was a growing feeling of angst among the England players towards their own coach, their fans and the media – a situation epitomised by striker Wayne Rooney’s on-camera outburst at the end of their painful goalless draw with Algeria. Their team’s poor form in the group phase had led to a more subdued approach to the match by the English media, but nothing could stop the tabloids from doing their usual thing in a slightly more diluted form. On the German side publications such as Bild a slightly more measured approach to their goading of the opposition, while Franz Beckenbauer described England as being both “burnt out” and “stupid”. These comments were not made maliciously – after all, Der Kaiser had always been an admirer of English football – but it didn’t stop some sections of the English media from turning it into a story anyway. It was, after all, just a case of finding more fuel to throw onto the fire. 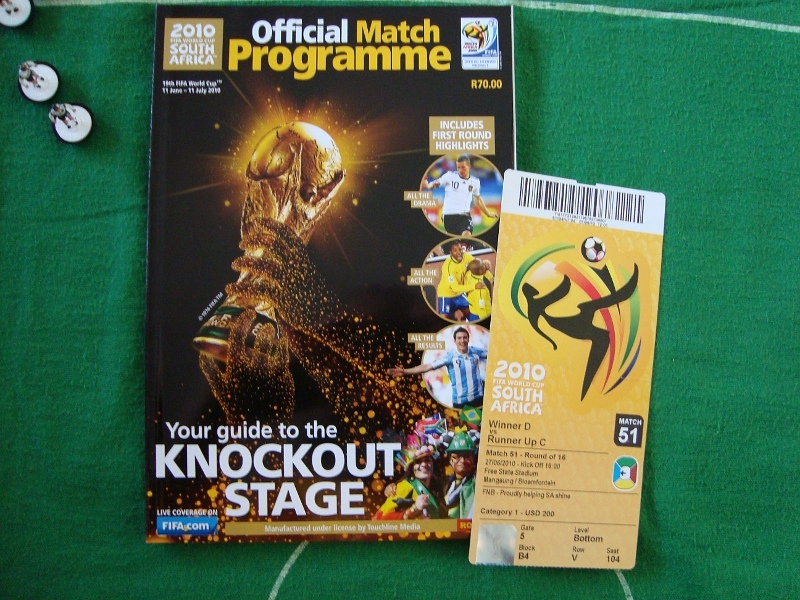 The meeting in Bloemfontein’s Free State Stadium would be the fourth encounter in World Cup finals tournaments between the two sides, with the last taking place in Turin in 1990 when the German team coached by Beckenbauer would overcome Bobby Robson’s England side on penalties; it was hard to believe that on that day the youngest member of Germany’s 2010 squad, Toni Kroos, would not have even been six months old. The two teams emerged on what was a bright Sunday afternoon on the Highveld, with Germany in their traditional Schwarz und Weiß and England in an all-red ensemble. After the national anthems – and the obligatory boos and whistles – Uruguayan referee Jorge Larrionda got the game underway to the sound that defined the tournament – the drone of an orchestra of vuvuzelas. Germany were quickly into their stride, with both midfield schemer Mesut Özil and wingers Thomas Müller and Lukas Podolski hitting their straps almost immediately. With not even five minutes on the clock the sprightly Özil had the first shot on goal after floating through the England defence; the shot itself was not struck with any great power but it was on target, forcing James into making a save with his legs. After what had been a fairly quiet and slightly cagey fifteen-minute spell, the game sparked into life when Germany opened the scoring what what could be described as a very English-style goal. No flashy moves or jinking runs from Mesut Özil or Thomas Müller here, just a route-one punt up the pitch by Manuel Neuer and a first-class finish from Mannschaft’s World Cup Wunder, Miroslav Klose. Both John Terry and Matthew Upson were completely caught cold, and Klose did enough to get ahead of Terry and hold off Upson before stabbing the ball past the advancing James with his right foot. It was Klose’s twelfth World Cup finals goal, taking him ahead of Jürgen Klinsmann and only two behind Gerd Müller. With just over half an hour gone Klose could very well have made it 2-0 when he found himself on the end of what would be the first of many quick bursts by the German midfield. Picking up a Philipp Lahm throw-in just inside the England half, Thomas Müller surged forward down the right, laying the ball inside to Sami Khedira who made the return pass with a cute backheel. Having continued his run to the edge of the opposition box, Müller playing a perfectly weighted ball forward into the path of Klose, who beat the offside trap before hitting his shot straight at James. The play quickly switched to the other end, as Jermaine Defoe hit the crossbar but was called back for a narrow offside decision. Almost immediately the ball was back at the other end of the pitch – and in the back of the England net. Unlike the route-one approach that had led to the opening goal, this was very much a finely crafted move which saw the England defence sliced apart with sudden bursts of pace and sharp, accurate passing. Having picked up the ball just inside his own half, Lahm found Khedira on his inside, who then laid the ball out to Müller on the right. Müller’s smart first-fime pass found Özil, whose touch outside to Klose was deftly flicked back inside to the advancing Müller with three England defenders being caught completely flat-footed. The Bayern winger advanced to the edge of the box, where he dinked the ball across to Podolski who had more than enough space to take his time. Poldi’s first touch was not great, but his second was more than good enough as he drilled the ball low into the right-hand corner of the net with his lethal left boot. The Mannschaft could very well have been three goals or more up already, and Miroslav Klose came close yet again when he was able to work himself free of his markers before seeing his slightly scuffed shot blocked by James. However just as Germany seemed all set to switch to cruise control, they took their foot off the pedal too soon and allowed England back into the match. First Frank Lampard had a shot cleared off the line by Lahm, and just under five minutes after Podolski had scored, a cross from Steven Gerrard found Neuer flapping at fresh air as West Ham’s Matthew Upson rose to head to ball home. Having gained what was an unexpected opportunity to claw themselves back into the match, England continued to press forward, and looked to have levelled the scores when Frank Lampard’s lobbed shot smacked the crossbar and dropped behind the stricken Neuer. The ball bounced back into the arms of the keeper, who just got on with it and threw the ball back into play. Cue protests, hand-waving and crowding of the Uruguayan referee – though on this occasion there was no Soviet linesman to help out. No goal, play on. OK, it was a good distance behind the line – but as they might have said back in ’66 – “that’s Fußball, mein Freund“. As the sides came off for the half-time break there was a crescendo of boos from the England supporters directed at the Uruguayan officials; it was clear that their side should have been back in the game at 2-2, but given the balance of play even the 2-1 scoreline flattered Fabio Capello’s side. The harsh reality for England and their supporters was that the Germans should really have been out of sight by this time. The second half got off to a slow start, with Steven Gerrard shooting wide for England and Arne Friedrich picking up an arguably harsh yellow card for clipping Jermain Defoe when he looked to have made contact with the ball first. The lull was then suddenly broken on fifty-two minutes by Lampard, whose free-kick from distance cannoned off the crossbar with Manuel Neuer well beaten. Gerrard was continuing to try his luck from distance and Neuer dealt well in coming off his line to foil Defoe, while at the other Thomas Müller bustled through the England before seeing his shot deflected wide only for the referee to award a goal kick. With an hour gone the play started to swing from one side of the pitch to the other. James Milner was foiled by Jérôme Boateng and a neat Rooney through ball to Defoe was well dealt with by Arne Friedrich, before another German break saw Bastian Schweinsteiger’s slow right-footed show slide narrowly wide of the target. With sixty-six minutes gone Rooney won another free-kick for England, which Lampard lined up. 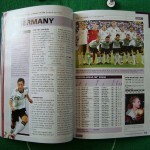 His shot was straight against the defensive wall, and within seconds Germany were engineering yet another swift break. Boateng’s short clearance was picked up by Müller, whose perfectly weighted ball out to the left was chased down by Bastian Schweinsteiger. Müller just kept on running, with Mesut Özil also covering ground at pace through the centre of the field. As the England defenders struggled to make their way back towards their own eighteen yard box, Schweinsteiger smoothly drifted inside before placing the ball into space on the right. There it was collected by Müller, who set himself up, took aim and crashed a stinging right-footed shot that seemed to fly through David James and into the back of the net. One could say that he well and truly Müllered it. Having re-established their two-goal cushion, this time there would be comeback for Capello’s side. Within two minutes it was all over, as another failed forward foray by the men in red was countered by yet another stunning break. A hoisted defensive clerance found Özil on the left, and the Bremen man simply powered past Gareth Barry and effortlessly charged into the England box. With most of the men in red still struggling to track back out of the German half, Özil deftly touched the ball inside into space where that man Müller charged in to meet it. James was given no chance as the ball whistled past him. Having swept into what was surely an unassailable lead, Jogi Löw’s side were content to slow things down and pass the ball around. The German coach also took the opportunity to give some game time to some of the squad players, as Mario Gómez came on for Miroslav Klose and man of he match Müller was replaced by Piotr Trochowski. It was England that made the next decent chance however, as Gerrard finally got a shot on target only to see it excellently turned around the post by Neuer. With the Germans clearly feeling that they had done enough and the England team looking to get away from the ground as quickly as they could, both teams went through the motions as the match petered to its inevitable end. When the final whistle blew after just over two minutes of stoppage time, Germany were through to the last eight for the sixteenth time – and England had been consigned to their biggest-ever World Cup finals defeat, surpassing their 4-2 reverse against Uruguay in 1950. While some of the more bellicose scribblers and even coach Fabio Capello were quick to lay into the Uruguayan officials, the majority of the English press were magnanimous in defeat – preferring to highlight the energy and verve of Joachim Löw’s young team and the all-round toothlessness of what had been a very poor England side. Rather than dwell on Lampard’s “goal” and the various what might have beens, many commentators preferred to look at the likes of Müller – a man who not even played a full Bundesliga season and yet had put England’s bunch of overpaid Premiership primadonnas to the sword. As for the outcome, it was much like Wembley 1972 all over again. Even though England had taken a mighty thrashing and had clearly suffered from having a perfectly legitimate goal chalked off, there was precious lack of ill will or bad feeling – unlike, say, 1996 when mobs of malcontents set about vandalising BMWs and attacking people with any accent that sounded remotely German – or not. Conversely, one can argue that the German side were professionally graceful in victory: the articulate skipper Philipp Lahm, the grounded Bastian Schweinsteiger, the self-confessed “quiet man” Mesut Özil, the schoolboyish Thomas Müller and the virtually undislikeable Miroslav Klose were light years away from the dark and brooding arrogance of Andreas Möller, Stefan Effenberg and Lothar Matthäus. While England departed with nary a whimper, Jogi Löw’s young German side went onto win even more praise in thrashing Argentina 4-0 in their quarter-final before finally being ousted by tournament favourites Spain in a closely-fought semi-final. 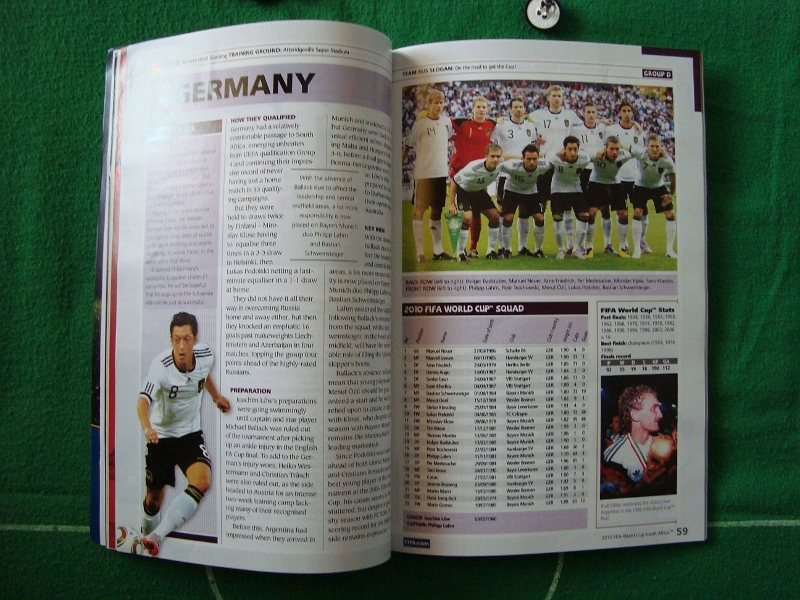 The Mannschaft’s bright and energetic performances during South Africa 2010 may not have made armies of young English lads don a Germany shirt as easily as they would an Italian or Brazilian one, but it made it OK to like this young German side. While England would struggle to develop their squad under a new coach, the German team that would achieve a creditable third-place finish in South Africa would continue to mature. The teams would next meet at the end of 2013, when Joachim Löw’s side would make another visit to Wembley. Overall: played 32, won 13, drawn 4, lost 15. Goals for 41, goals against 67. It might be worth mentioning that Beckenbauer calling the English team stupid was more of a translation error than actual name calling. The media translated the german word “dummerweise” which means “unfortunately” to the word “stupdidly”, which is the more literal translation of “dummerweise” but has a different meaning. Pretty much as I thought. That said, he was probably correct either way.